Yellow Sapphire or Pukhraj is a gem of 'Corundum' family. It is found in yellow, orange and golden colors, as well as in a colorless variety known as colorless sapphire or white sapphire. Yellow Sapphire has brilliant yellow color. Yellow Sapphire gives material wealth, prosperity and status. It also recovers the overall health. Yellow Sapphire gemstone is very suitable for those people who are hopeful for administrative and political positions and blesses women with good children. Yellow sapphire has many healing powers. Yellow sapphire associated with the planet Jupiter. Wearing a yellow sapphire gemstone attracts Jupiter's blessings. 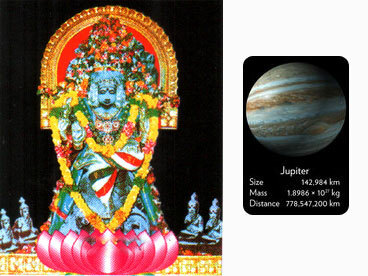 Jupiter or Brahaspati is also known as Guru of all Devtas. Wearing yellow sapphire helps in the business and career. 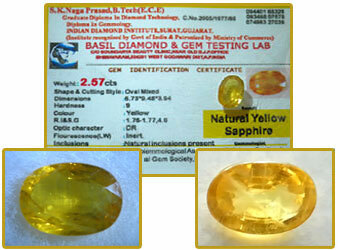 Yellow Sapphire is good for person with solar sign, Sagittarius.